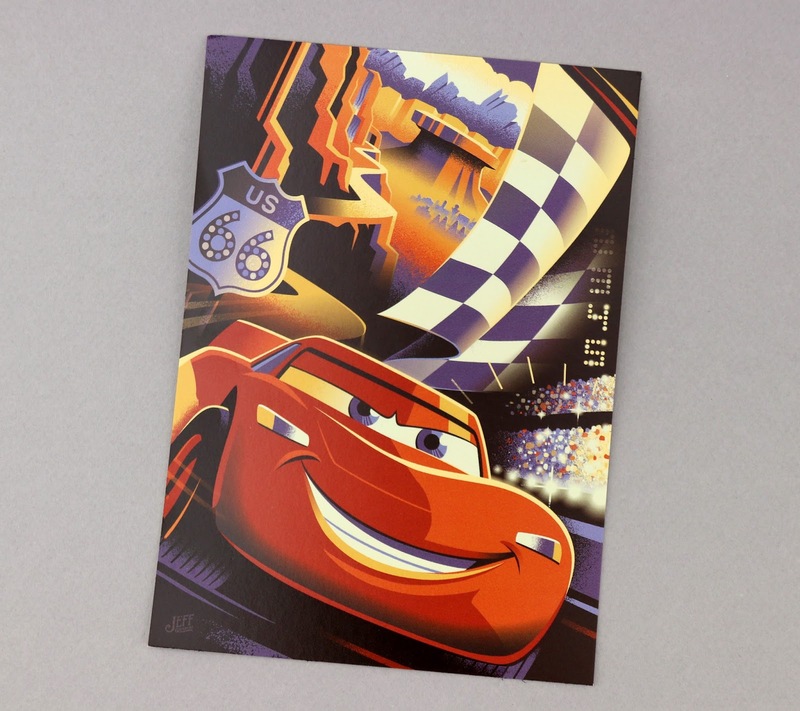 Here I'm taking a look at another neat 5"x7" postcard print that I picked up in Cars Land while visiting California Adventure this past summer. This one is called "Cruisin' to Ka-Chow" by artist Jeff Granito! I had never seen this piece before (or heard of the artist for that matter) prior to going, but I definitely thought the design was cool enough to pick up along with the others I purchased. Retail was $4.99 at the Ramone's House of Body Art shop. Note—If you missed them, check out the other designs I reviewed over the past few weeks: "New Wheels", "Race Around Radiator Springs" and "Cozy Cone Arrival." All of these were put out this year in celebration of Cars Land's fifth anniversary. I really like how each artist captures Cars in their own unique way! The more I look at this piece, the more I like it. I like how McQueen's fast pace racing life is shown in contrast to his slowed down Radiator Springs life (brilliantly divided by the racing flag—really nice composition all around). I also think it's pretty cool that, even though the Radiator Springs town buildings are tiny and silhouetted in the distance, you can still make out their iconic shapes. 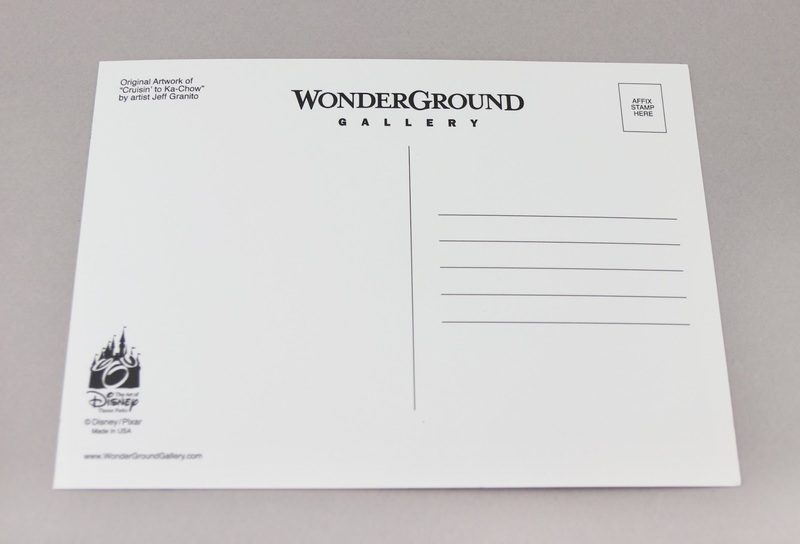 The muted, more desaturated color palate really works nicely for this print as well. 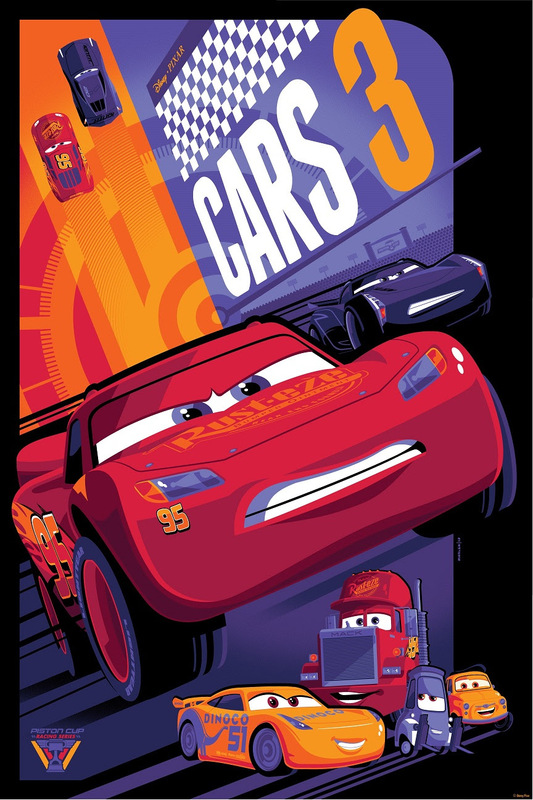 Lastly, I do have to note that the style of this piece kind of reminds me of another one of my favorite Disney freelance artists, Tom Whalen (to see what I'm talking about, HERE is Whalen's Cars 3 piece he did this year). Anyone else think that? I guess you can say that I'm "drawn" to a particular style! OK to wrap things up...it turns out (now that I looked up this artist) that I DO know his work (we have one of his Haunted Mansion postcards). He has some really fantastic Disney art and tons of it too! You'll want to check it all out. Learn more about Jeff Granito on his site HERE and if you like what you see, be sure to follow him on Instagram HERE and Twitter HERE. Good work Jeff! Consider me a fan. Get this while you can at Cars Land (again, Ramone's House of Body Art) or at the Disney Springs/Downtown Disney Wonderground Gallery. Let me know your thoughts in the comments below!